radiation to reach the earth as sunlight. • If you know one, you know the other. Calculate the frequency of an X-ray that has a wavelength of 8.21 nm. • Remember, as  increases,  decreases, and vice versa. frequencies) of visible light are observed. vibrational energy is released as EM radiation. amount of energy a system can gain or lose. gets higher & the wavelength gets shorter. phenomenon called the photoelectric effect. (photo-), they emit electrons (-electric). minimum value – called the threshold frequency. proportional to the intensity of the light. 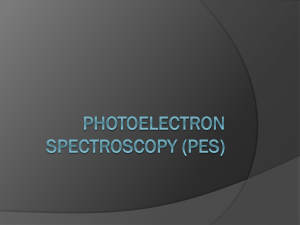 – Each photon has an energy given by E = h. energy to knock an electron loose. photons means more electrons ejected. proportional to the intensity of light. in 1918 for his quantum theory. of atomic line emission spectra. spectrum, or a line emission spectrum. electron in a hydrogen atom. corresponds to a specific energy. 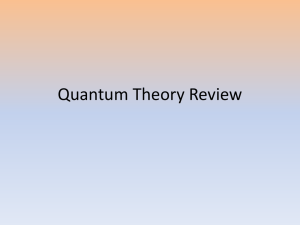 quantum number (n = 1,2,3,…). level is said to be in the ground state. define En = 0 when n = . difference in energy between the two levels. having E = 0 (hence the negative energy values). by electrons in a hydrogen atom. in the line emission spectrum of hydrogen. hydrogen atom from the n = 5 level to the n = 3 level. undergoes a transition from the n = 4 to n = 5 level. similar to that observed with light. picture of the hydrogen atom. 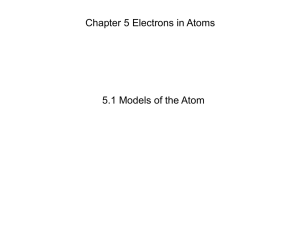 energies of the electron in a hydrogen atom. equation are called wave functions (). describe the exact location of an electron. infinitesimally small volume of space in an atom. within which electrons can usually be found. atom. We don’t know exactly where the electrons are. of science established in 1927.
of its very small size and mass. change the momentum of the electron. about the location of the electron. electrons that are in the same atomic orbital. n = 1, 2, 3, 4, . . .
Electron Shell that the orbital is in. orbital – a higher n value means a higher energy. orbital is in (within the larger energy shell). specific type of orbital with a unique shape. shaped like dumbbells (l = 1) – more on this in a minute. p subshell containing three p orbitals. s subshell containing one s orbital. Within a p or d subshell, how do you distinguish between the individual orbitals? the directional orientation of the orbital. pointing along a different axis in space. 1 subshell because ml = -1,0,1.
subshell because ml = -2,-1,0,1,2.
set is not possible, state why not. 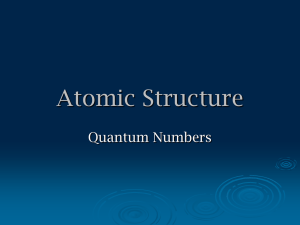 in the following quantum number assignments. a) n = 3, l = 1, ml = ? 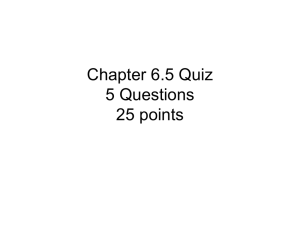 c) n = ?, l = 3, ml = ? each of the three p orbitals in the 2p subshell. 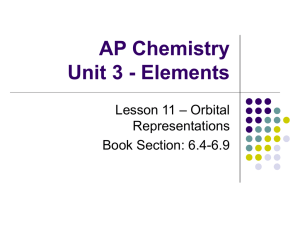 characterize all of the orbitals in an atom. to describe all of the electrons in an atom. one of two values (+1/2 & -1/2). number, those spins are said to be parallel. are said to be paired. spins must be paired (+1/2 & -1/2). same ticket (sit in the same seat). designation & determine the possible values of ml. How many orbitals in shell n = 1? How many orbitals in shell n = 2? each of the two electrons in the 3s orbital. also illustrating the spins of the elctrons. orbital in a subshell is occupied. box orbital diagram for oxygen (1s2 2s2 2p4). box orbital diagram for boron (1s2 2s2 2p1). • Add the rest of the electrons at the end. 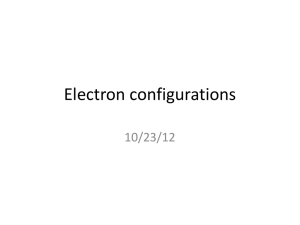 Now we know how to write electron configurations. 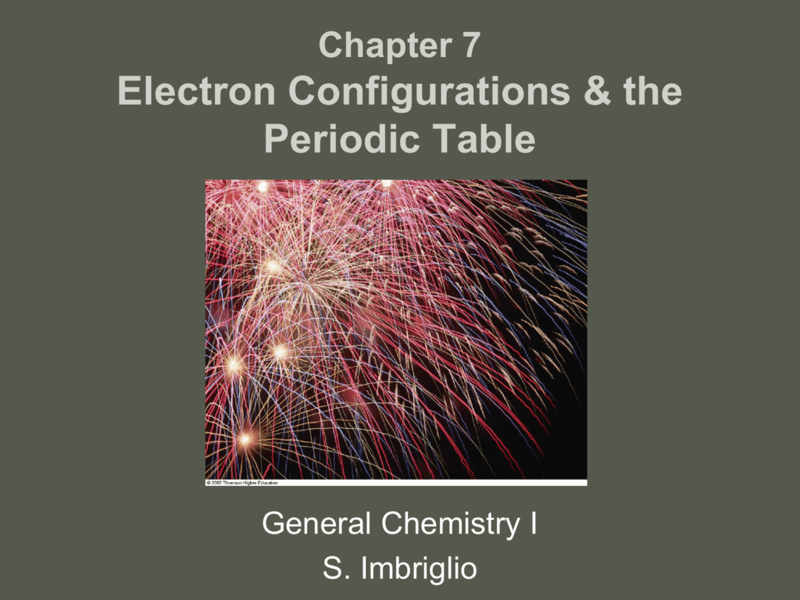 electron configuration for an element is??? number of possible electron configurations. filling the lowest energy orbitals first. subshells, just use the periodic table! the desired element is reached. Notice: (n – 1)d orbitals are filled after ns and before np orbitals. 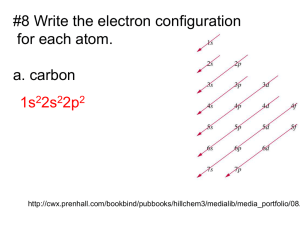 • Write the electron configuration for Al. • Write the electron configuration for As. Write the electron configuration for Sn. after ns orbitals and before np orbitals. so the more parallel spins, the better. maximizes unpaired electrons - Hund’s Rule. • Such substances are called diamagnetic. attracted to a magnetic field. in atomic trends and reactivity. • How do we explain the trends in the periodic table? electrons is equal to the group number. directly related to its reactivity. element & its valence electrons. One dot equals one valence electron. type of cation (+) or anion (-) an atom will form. noble gas – more on this later. - Group 1 metals form cations with +1 charge. 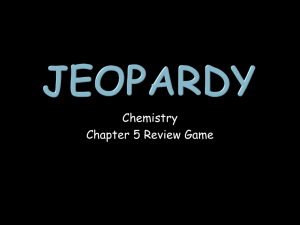 - Group 2 metals form cations with +2 charges. - Group 6 elements form anions with -2 charge. charge of the nucleus (Z). atomic radii within the same group. configurations are said to be isoelectronic. with the noble gas in the same period. with the noble gas in the preceding period. down a group in the periodic table. across a period in the periodic table. becomes harder to remove an electron. across the periods in the periodic table. beryllium is higher than that of boron. Why? Li forms Li+ cations and Be forms Be2+ cations. an atom to form a 1- anion. 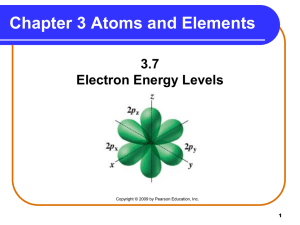 atom has for an additional electron. noble gas configuration (filled n = 2 shell). • Most electron affinities are <0 (favorable). atoms with filled subshells (Groups 2A & 8A).